I’ve so far documented nine cabinet card photographs of dentists and physicians who studied and/or practiced in Baltimore. Alexander Douglas McConachie (1864-1951) number ten, is the only one not from the United States. Born in Woodstock, Oxford, Ontario, Canada to Scots immigrants William and Elspeth (Shand) McConachie, Alexander came to Baltimore to study dental surgery and medicine in 1886. He was part of the University of Maryland Department of Dental Surgery graduating class of 1888, along with Leonidas Wilson Davis and Frank Ryland Steel. Dr. McConachie went on to study medicine at the University of Maryland and earned an MD there in 1890. He did post-graduate work at Johns Hopkins, and then pursued his medical studies in Europe. During World War I, Dr. McConachie served in the Army Medical Corps in Orleans, France. He was president of the Medical Alumni Association of the University of Maryland for 1923-1924, and a professor on the faculty of the Maryland Medical College. McConachie settled in Baltimore and in 1898 married into an old Cecil County clan. His wife, Mollie Manly Thomas Drennen, through the Hylands traced her Elkton roots back the 18th century. According to a Daughters of the American Revolution Lineage Book, Mrs. McConachie was descended through her mother, Ann Elizabeth Worrall Manly, from a Lt. John Hyland, born in Kent County, Maryland, in 1746. After his marriage, Dr, McConachie and his wife settled on Charles Street, in Baltimore, where they lived for the rest of their lives. McConachie, who specialized in disorders of the ear, nose and throat, had his practice at the same address for 50 years. Fortunately, his gospel did not stop him from enjoying life. An avid sportsman, he loved the new pastime of “motoring” and “hoped to fly.” He liked movies and the theater, and read widely. 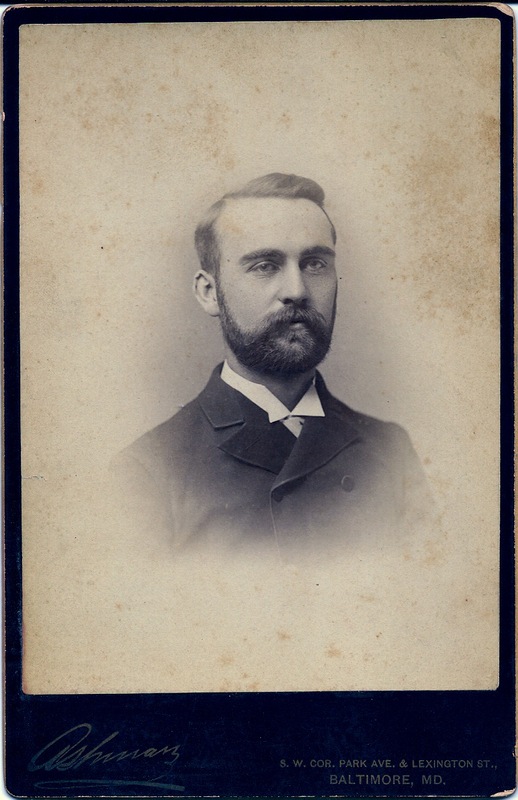 The portrait of the young doctor here was taken at the studio of William Ashman, probably as a graduation remembrance in the late 1880s. The National Library of Medicine’s later portrait of Dr. McConachie shows a handsome man in his confident prime. He and his wife are buried with his wife’s people in Elkton Cemetery, Cecil County.